The term originally denoted tall winged leather cavalry boots, which had been "jacked", or reinforced against sword blows by use of mail sewn into the lining of the leather. The wings on these high boots particularly protected a rider's knee-joint from a sword blow. These boots are still worn and still so termed by the Household Cavalry Regiment of the British Army, founded in the 17th century. The term originates from the French word Jaque (m) meaning mail. The term is of Catalan origin, descended from the Arabic shakk. These boots were made very heavy by the mail reinforcement, and are slightly less so today from the use of modern materials as stiffeners. There are few manufacturers of cavalry jackboots extant in the 21st century, the most famous being Schnieder Boots (pronounced 'Shneeder') of Mayfair, London, the official supplier to Her Majesty the Queen's Household Cavalry. The second meaning of the term is derived from the first, with reference to their toughness, but is unrelated in design and function, being a combat boot designed for marching, rising to at least mid-calf, with no laces, typically a leather sole with hobnails, and heel irons. The Germans call this boot Marschstiefel, meaning "marching boot". This is the classic boot used by the German infantry in World War I, though the stormtroopers dispensed with them in favor of laced boots then used by Austro-Hungarian mountain troops. An etymological source not derived from the cavalry jackboot has been suggested as from the word jack, jacket or jerkin, as a common garment worn by the peasantry. Although hobnailed short jackboots date from before the Napoleonic era, they became popular with the Germanic armies in the mid to late 19th century because of their perceived durability. Worn out boots were considered a major problem for armies on the march, and the high-quality leather "jackboot" with its hobnails was deemed to be more durable than the alternatives available. 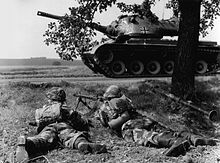 As Prussia and the associated smaller German states relied on quickly defeating its opponents before they could fully mobilize and coordinate, their infantry's ability to march long distances was a major issue. The jackboot was replaced by poorer quality ankle boots in the German army when leather became scarce during World War II. The legging of the boot was shortened to a standard 12 inches in order to save leather, without negating its protective value, especially on the Eastern Front. The previous issue boots were as tall as riding boots, reaching almost to the knees. 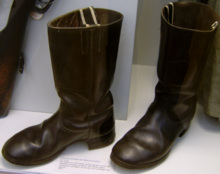 The boots are connected to fascism, particularly Nazism, as they were issued by the Wehrmacht and SS as part of the World War II German uniform before Germany encountered leather shortages. When goose-stepping on pavement, the large columns of German soldiers in Marschstiefel ("marching boots") created a distinct rock-crushing sound which came to symbolize German conquest and occupation. A similar style of boot had been in use with German armies in World War I, the Franco-Prussian War, and before. Jackboots were also associated with the armies of the former USSR (called sapogi) and East Germany. 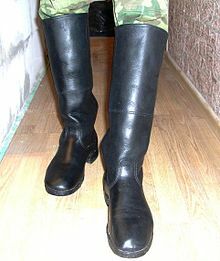 Jackboots are still a part of the modern parade and service attire of the army of Russia and several other former Soviet states. The word is commonly used in English as a synonym for totalitarianism, particularly fascism, although jackboots and similar types of footwear have been worn by various British regiments since the 18th century (see Wellington boot, origins). Following the 1982 invasion of the Falkland Islands, British Prime Minister Margaret Thatcher declared that the democratic rights of the Falkland Islanders had been assaulted, and would not surrender the islands to the Argentine "jackboot." In the United States in October 1993, the National Rifle Association (NRA) ran a 4-page ad in the center of its American Rifleman magazine, the first page of which showed goose-stepping, jackbooted legs under the question, "What's the First Step to a Police State?" Two years later, the NRA's executive vice-president, Wayne LaPierre, sparked controversy when he referred to federal agents as "jackbooted government thugs" in an NRA fund-raising letter. The term had been coined by United States Representative John Dingell, Democrat of Michigan, in 1981. Such statements prompted former U.S. president George H. W. Bush to resign his membership in the organization soon after. 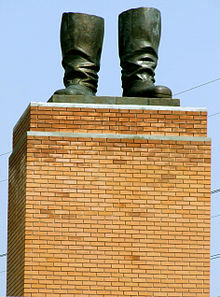 The Russian expression "под сапогом" (pod sapogom) "under one's boot" translates as "under one's heel" and symbolizes oppression. The Spanish expression "tener (algo o alguien) bajo la bota" or "to have (something or somebody) under the boot" has the same meaning. ^ Household Cavalry Uniforms - Boots. Householdcavalry.info. Retrieved on 2010-11-16. ^ Larousse Dictionnaire de la Langue Francaise, Lexis, Paris, 1993, "cotte de mailles"
^ "What's the First Step to a Police State?". American Rifleman (Advertisement). National Rifle Association. October 1993. ^ Butterfield, Fox (May 8, 1995). "TERROR IN OKLAHOMA: ECHOES OF THE N.R.A. ; Rifle Association Has Long Practice In Railing Against Federal Agents". New York Times. Retrieved April 7, 2014. ^ Bush, George H. W. (3 May 1995). "Letter of Resignation Sent By Bush to Rifle Association". New York Times. Retrieved 23 July 2015. Wikimedia Commons has media related to Boots.